As the title screen kicks in the first thing that struck me was the introduction music. What is this digitized mess? I never imagined it to replicate the Amiga theme accurately, but with the lyrics absent the irony of ‘War never being so much fun’ was lost. In fact playing this game now, some 20 years after it was made the idea of irony permeates the whole experience. 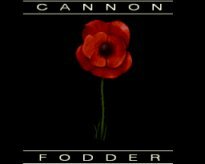 Its well documented elsewhere on the internet that The Royal British Legion were not best pleased that Sensible decided to use the iconic poppy through this game, on its title sequence and its box art. The SNES box was changes to caricatures of the initial squad, but the poppy remains in game and the Amiga versions even include a “This is not in any way endorsed by the ROYAL BRITISH LEGION” disclaimer. The irony here being, that (Metal Gear Solid aside) this is one of the most anti war games I have ever played. patiently queue to head off to the front line. As you progress through the game this hill becomes covered with an individual cross for each player you have lost. Quickly going from a bare green mound, to one literally covered with crosses to the point that barely any green remains by the end. I can’t help but think had the British Legion seen this not entirely subtle metaphor for the futile of war and the senseless waste of life, the game would have been applauded; I guess they never got past the tongue in cheek ‘War has never been so much fun’ tagline. I can forgive them - it was lost on the 10 year old version of myself. I would continually re-load a mission rather than see my initial two characters die, partly to save my namesake, partly so that I looked better at the game than I was. To my younger self, war saw no heroic loss of life, but it did see a lot of angry replaying of the first section of missions! The main game is essentially an overhead strategy game. The player taking up to six soldiers through a range of war torn locales, massacring the enemy soldiers, avoiding killing the innocents, and destroying any opposing strong holds and infantry. On the Amiga this controlled relatively efficiently by left clicking the mouse to move the troops and having them fire in the direction of the cursor with the right hand button – Its Call of Duty for the point and click generation. The translation to control pad makes the whole experience much clumsier and frustratingly imprecise. Given that you have 2 dormant shoulder buttons, the method of throwing grenades (holding down ‘fire’ and tapping ‘walk’) is somewhat hit and miss. More often than not my brave little 8 pixel high heroes would often stumble selflessly into their inevitable death rather than obliterate an enemy shed. At times as the game becomes more frantic, the pointer literally can’t keep up with the action, so success depends as much on chance as it does strategy. I can’t help but think that if Cannon Fodder had been made now it would be a twin stick shooter and would no doubt be a lot more accessible than this is. Control becomes even more unpredictable when vehicles are introduced, with pixel perfect leaps a mainstay of later levels. I even struggled to get my squad in a tank at times, game mechanics should never be the barrier to progression. The solution to this was dividing up the squad, to get multiple attempts; which was quite frankly a terrible idea. AI for those you leave behind is laughable. They will waste grenades, at best against any enemy that stumbles their way and at worse on themselves. Like lambs to the slaughter, any non controlled character will simply stay where ever you left them. They make no attempt to get away from an enemy, (ironically) they literally become cannon fodder. As a game it’s frustratingly hard at times, when it need not be. The console port should have seen you in direct control of your characters, with the moving in which ever direction of the control pad commanded. I presume back in the day, ports considered not the merits of each system but instead strives for making the experience as close as possible to the source. So, how happy am I with ‘one of my favourite games of all time’ now that I’ve actually played it within the last 20 years. Well, it’s still on the list although not as high. Taking out nostalgia, you still have a fun and rather unique game that lends itself to both short bursts and longer sessions. The levels though similar are varied visually, and there a pretty lengthy game length. I do adore the Sensible style of art direction that seems remarkable current given the modern day tastes for pixel art in a lot of casual iOS games. For me tactical Warfare really has never been so much fun, charming or indeed poignant. Though War was a whole lot more fun on the Amiga. Finding this was relatively simple, eBay. I treated myself to this for less than £15 including P&P on my 31st Birthday – the day I decided to actually start my SNES collection. Its near mint, boxed with instructions. Nice post! I like the way you contrast your memories with the modern experience. I look forward to reading more! 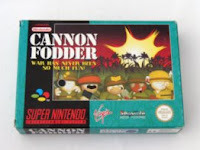 Love Cannon Fodder, but prefer Sensi Soccer!